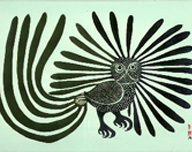 Since 1991, the Dennos Museum Center's core collection of Inuit art has been on permanent exhibit. The Power Family Inuit Gallery, named in 1995 for their generous support of Inuit art and the Dennos Museum Center's collection, has welcomed thousands of visitors to view, explore, and discuss contemporary Inuit art. The Inuit art collection has also played a pivitol role in K-12 programming in the region, providing local students with primary source perspectives of life in the Canadian Arctic. With the opening of the Barbara & Dudley Smith Wing for Inuit Art in 2018, this unique collection has more space for exhibition, education, and engaging programs. Thanks to the generous support of the Smiths and others, the Dennos Museum Center will continue to be a leading institution for the celebration of Inuit art and culture in the United States.